The Odoo inventory management is robust and features rich. It encompasses many qualitative and intuitive feature helping the industry in large for their successful sustenance and growth. 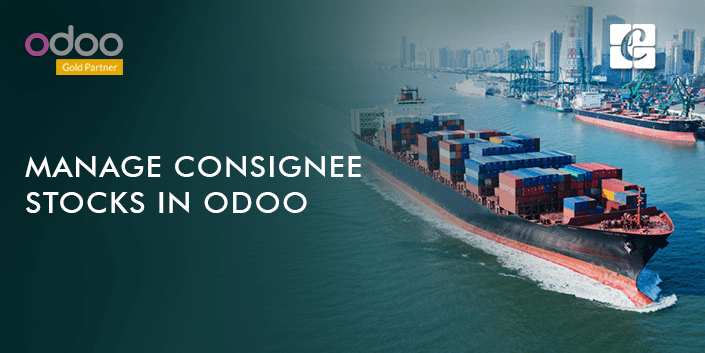 In this blog, we will discuss an important feature titled consignee stock management which comes under Odoo inventory. A consignee stock management is moreover a kind of agreement where the industry handles a particular stock which is not owned or authored by them. By definition, consignment is an agreement existing between a third party consignee and an owner. Here the consignee or the third party is selling goods, which belongs to another person via his inventory in exchange of a fee. How consignment work is carried is as follows. This is moreover like an agreement, here an item will be placed under the supervision of a third party until it is bought by a buyer. Here the consignee denotes the person who stocks the item and consigner denote the person who has produced the stock, that is the real owner of the stock. Here the owner is embedded with complete responsibility of the product until it is sold. The consignee has the job role of only caring or keeping the stock. Let’s illustrate this with an example. Suppose there are two persons namely A and B. Let A be the owner and B the consignee. A gives his product to B for keeping. No monetary exchange is taken place here. The only action triggered is the exchange of products. A is still the owner in this case. Later, a customer purchases this item from B who is the consignee. Now B will give the money earned from purchase to the owner A. Eventually, B will receive an amount from A in return for keeping the item. This is how consignment stock works. The consignment is fully based on trust. The E-commerce websites are considered to be the perfect examples for consignment agreements. Here the E-commerce website will play the part of the consignee. Odoo ERP is robust in handling the consignee stock, it has got advanced feature settings to make this happen in an efficient manner. Now in the product owner section, select the manage consignee stocks (advanced) option, finally click on apply. Go to the inventory’s dashboard, from there open the receipt and later create a new reception. In the above screenshot, you can see there is a line mentioning the owner. Here the user has two options, either to specify the partner who rightfully owns the stock or keep them blank if he is the owner. This is how consignee stock management works in Odoo ERP software. This is a very handy feature since the usage of E-commerce websites is exploding tremendously as days pass by. If you are interested in Odoo ERP for your business, kindly drop your message to info@cybrosys.com. We can guide you with better Odoo support plans for executing your organization functions. Cybrosys Technologies is an exponent in Odoo ERP solutions with more than 10 years of experience.